Under City Hall Plaza is an abandoned T tunnel that was in operation from the end of the 19th century to the early 1960s. On May 21, 100 people will have the rare chance to tour the tunnel. Beneath the brutalist structure of Boston City Hall is a dusty abandoned train tunnel that was once a part of America’s first subway line, the Tremont Street Subway. On May 21, in honor of Preservation Month, 100 people will have the rare opportunity to tour the cavernous space, which was in operation from the end of the 19th century to the early 1960s. The Boston Landmarks Commission and city’s Archaeology Program worked for several months to make the tours happen, but city archeologist Joe Bagley said they never expected such an outpouring of interest. Bagley posted the free events on social media at noon on Tuesday, and within half an hour, all five 20-minute tours were full. Over the next 24 hours, thousands more clicked on the link. So, fear not, aspiring urban explorers. Officials are already working on hosting more tours in the near future. Organizers plan to place a row of lights inside the empty tunnel so it will be well-lit for those who want to take pictures. Ticketed visitors are asked to wear sturdy shoes as it’s plenty messy down there. 1. 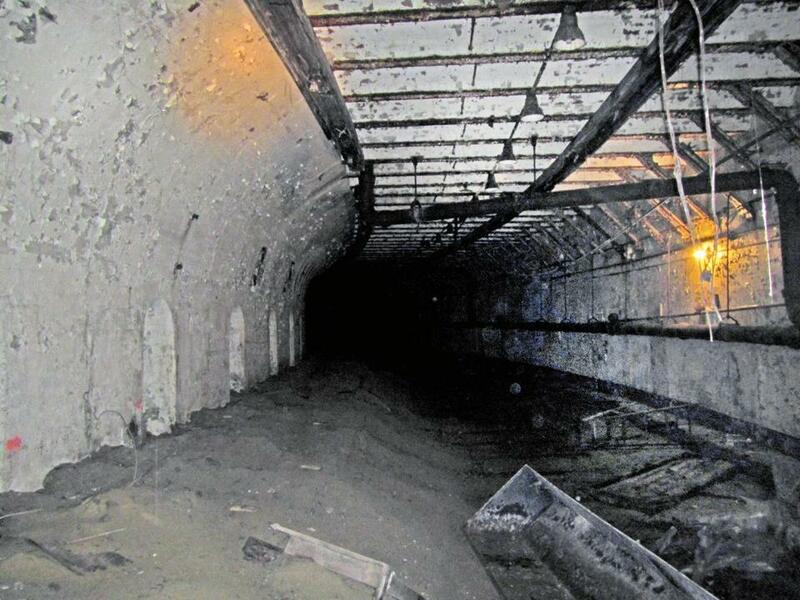 The now-abandoned subway tunnel first opened in 1898 as an extension of the Tremont Street Subway, which opened in 1897 between Boylston and Park Street Stations. It was the first subway system built in the United States. There is a collection of black and white photographs by the Boston Transit Commission of sites related to Boston’s underground transit system on the City Archives’ Flickr page. 2. The tunnel spanned from Scollay Square to Adams Square along what used to be Cornhill Street. Unlike an abandoned subway in New York City that has colorful mosaics, this is a fairly simple space. There’s an antechamber and then a door, which gives way to a vast interior that doesn’t contain much except some bits of rusty metal and an old chair. 3. It was abandoned in the early ’60s as part of the redevelopment of Government Center. There is also an abandoned subway station in the city called Court Street Station, which is located under the front steps of 26 Court St. and still contains some of the original platform. 4. Located under City Hall Plaza, the tunnel is only accessible through the City Hall garage. Bagley estimates the tunnel is about 15 feet high, 200 to 300 feet long, and 30 to 40 feet wide, enough room for two trains to pass through. 5. The tunnel contained two lanes of northbound trolley cars, one from Tremont Street and a second that looped around from Brattle Street, which existed until the early ’60s, when Government Center was redeveloped. The western end of the tunnel has a concrete corner, which makes up one of the corners of Government Center Station.